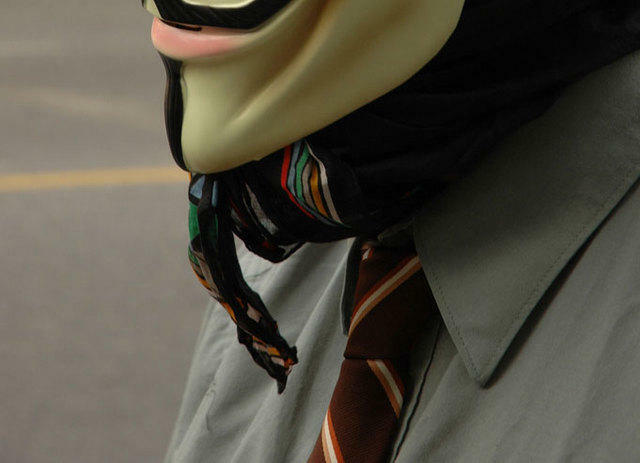 Things between Anonymous and the Church of Scientology have been getting downright nasty lately. Vindictive, even. For much of the last week, Project Chanology’s local adherents have been holding court at Scientology’s Yonge Street chapter, carrying out what they call “flash raids.” Unlike the broader, theme-based demonstrations of the past few months—addressing everything from the Church’s notorious Fair Game policy to its very own, admittedly hilarious private navy—the community-targeted, information-based flash raids are, in comparative terms, not unlike the ubiquitous mall kiosks festooned with remaindered copies of Dianetics and stress tests: it looks like Scientology will just have to get used to them. That’s not to say they’re taking it in stride. 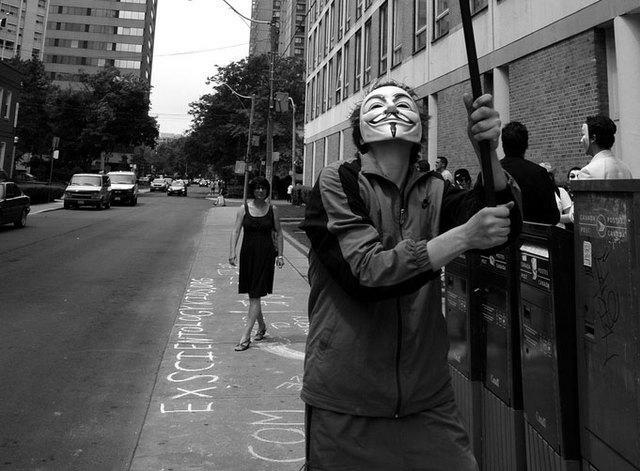 In response to Anonymous’ constellation of indictments—ranging from an alleged history of tax fraud to more than a few disturbing human rights violations—operatives within the church, and definitely the local organization, have taken to the streets themselves, although without the en-masse presence that Project Chanology has maintained. 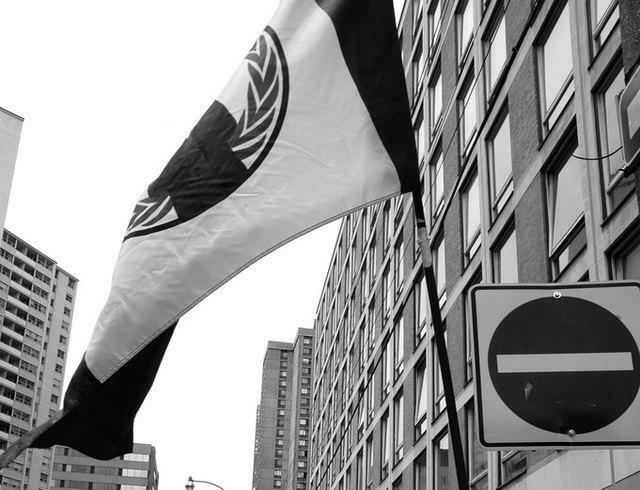 While Anonymous’ unnervingly exhaustive manifesto stops short of dropping the t-bomb, Scientology’s response has been peppered with truncated, unofficial quotes lifted from YouTube and 4chan, essentially profiling the web-based movement as a band of hate-motivated terrorists. 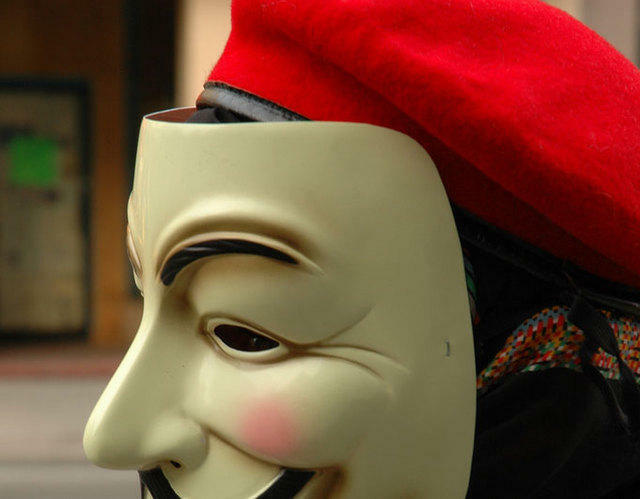 “Anonymous is devoid of humanity, morality, pity, and mercy. At press time, the above is conspicuously absent from the entry in question. While it appears as part of “The Sekrit Code of Anonymous” in an Encyclopedia Dramatica entry, the quote refers to the meme of Anonymous as an online phenomenon spanning the breadth and history of the Web, of which Project Chanology is a recent, focused manifestation. Addressing the Project’s disputed legality, Scientology is markedly more vague: “It does not matter how many of us are knocked out,” the Church cites, referring to this YouTube video. “‘Remove one head, and ten replace it. '” Why only the latter appears quoted is unclear, but likely related to its absence from the video’s transcription. Instead, the words belong to user Karasuetpeople, posted to the video a month ago. Because of the vast, structureless body of Anonymous and the obviously heated nature of the issue, the ownership and intent of such quotes on either side can’t be reasonably ascertained from online sources. So, like good little neo-Luddites, Torontoist once again closed its laptop and pulled out its thirty-dollar voice recorder. An hour later, we followed up on that earlier request for an interview. As staff members we’d talked to had since changed shifts, a gentleman in a red Dianetics shirt—reportedly a member of the local org’s Office of Special Affairs—welcomed us. After our introduction, a knowing expression flashed across the man’s face, and we were guided back toward the entrance. “Have a nice day,” he said, holding the door. Then he locked it in our faces. All photos by Jon Robertson.